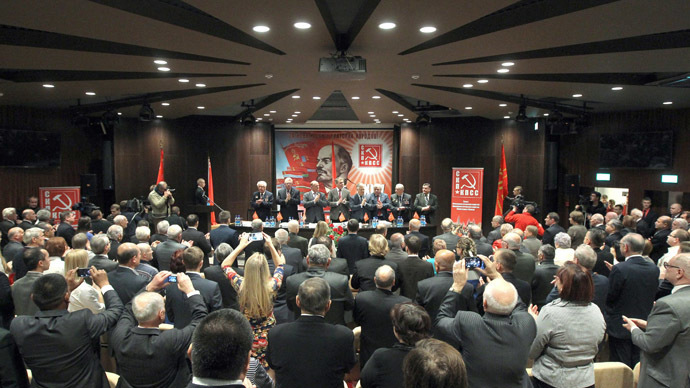 Two Communist party lawmakers want the parliamentary leaders to recall Russia’s delegation from PACE. They maintain that membership in this organization has only a “negative influence” on the country. MPs Sergey Obukhov and Valery Rashkin addressed the chairs of the lower and upper chambers of parliament with an open letter in which they said that Russia’s membership in the Parliamentary Assembly of the Council of Europe should be completely abandoned. According to the letter the move was necessary “for maintaining the reputation of the country and in order to deprive our opponents of the opportunity to issue prejudiced reports about Russia and send monitoring missions in order to exert consolidated negative influence on the Russian Federation,” the message reads. A typical example of such policies was the resolution passed in April 2014 that stopped the powers of the Russian delegation in the assembly because of the position on the Ukrainian conflict. The communists also noted in the letter that the anti-Russian character of the international body became evident after two leaders of the Russian Communist Party – Gennady Zyuganov and Ivan Melnikov – were assaulted just near PACE’s headquarters in Strasbourg. Earlier this week State Duma speaker Sergey Naryshkin described the limitation of Russia’s powers in the PACE as unlawful. “Explaining the April decision by Crimean events is not a rightful step because Crimea’s reunion with the Russian Federation was made on the basis of the most democratic procedure of all – the referendum in which 97 percent of Crimean residents supported the reunification with their motherland, Russia,” Naryshkin told reporters during his visit to Strasbourg. The conflict between Russia and PACE developed in 2013 and 2014 as Russia opposed the coup d’état in Ukraine that brought the current Kiev regime to power. In April last year, the European body approved an anti-Russian resolution, depriving Moscow’s delegation of the right to vote, and banning it from participation in ruling bodies and monitoring missions till the end of the year. The Russian State Duma replied with a resolution saying that nations which have repeatedly violated international law, causing thousands of casualties, have no moral right to judge Russia or impose sanctions on it. MPs also said that they considered it impossible to resume discussions at PACE while sanctions against Russia are still in force. In August, State Duma Foreign Relations Chief Aleksey Pushkov said that Moscow might completely give up its PACE membership if European sanctions against Russia remain in place.